I've been called a perfume snob. Sometimes that epithet is hurled my way as a knee-jerk reaction to a negative review of a mainstream / department store scent...or to a positive review of an expensive perfume that's hard to find. Can't win for losing! I am not a perfume snob; I always give inexpensive colognes a try (and occasionally buy). Though I visit supermarkets about as much as Bill Gates and Oprah (that's what husbands are for, right? ), last weekend I went to Seattle's Eastside to the Asian Food Center to buy (strangely realistic) faux ham and bacon. See, I'm not a food snob either; these (more-expensive-than-the-real-thing!) products from Taiwan allow this Virginia boy to eat "ham" without guilt...or gagging. While in the market, I dropped into the toiletries aisle to see what was new from Taiwan, Hong Kong, Thailand, mainland China and Japan. I found something new: Liushen Florida Water from Shanghai. Liushen Florida Water is NOT related to Murry & Lanman Florida Water (gasp, now sold in flimsy plastic bottles). Liushen Florida Water is China's most popular brand of "Florida" ("floral") water. I bought a $5 bottle at the market; the cashier gave us a pointed look as she took the bottle to ring it up. Maybe it's rare for white guys to buy Liushen Florida Water or she felt we didn't know what we were buying — every word on the bottle is in Chinese. Shanghai Jahwa United Co., Ltd. (once known as Kwong Sang Hong Ltd.) is one of China's oldest producers of toiletries (this year it celebrates its 120th anniversary); Liushen is one of its brands. 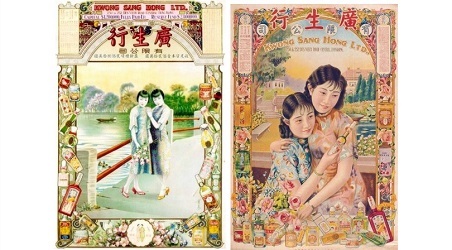 If you love the delightful, vintage Chinese cosmetics calendar posters from the early part of the 20th century you're certainly familiar with the Kwong Sang Hong name, albeit in an advertising format. 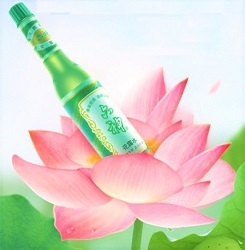 Liushen Florida Water is supposedly produced with traditional Chinese medicine ingredients; it's used in China not as a fragrance, but as a mosquito repellent and a wound sterilizer and to ease skin irritations (itching). Liushen has a cooling, mint/menthol effect on skin when first applied. It's "perfume air conditioning" in hot and humid weather. Reading online, I found that non-Chinese in China use it for many things: as a perfume and aftershave, a muscle soak (added to bath water); the most unusual use: swab ceramic tile and stone floors with water and Liushen Florida Water to cool (and scent) the environment as the mixture evaporates. The aroma of Liushen Florida Water instantly takes me back to Los Angeles's Chinatown; its scent is a combination of the sandalwood and jasmine soaps I'd buy there as well as the stores that were full of the aromas of floral incense burning on shop altars. Liushen Florida water has an intense, "volatile" scent when first applied: camphorous/minty notes, strongly scented "spring" flowers, jasmine incense sticks. If you apply lavishly, and why not...you can get a case of a dozen bottles for $55!, the scent will linger on skin for hours (with not much sillage). I enjoy wearing Liushen Florida Water as a light cologne; if anyone ever calls me a perfume snob again, I'll direct them to this post and say, "I wear bug spray as perfume. So there!" To purchase Liushen Florida Water (195 ml for approximately $5 U.S.), check out your local Chinese markets (there's also a bath gel). This review is of the "classic" Liushen Florida Water formula; Liushen has added different scents to the floral water line (in cute bottles) but I've not seen them sold in the U.S. yet. For fun, watch a Liushen video. Note: top images for Kwong Sang Hong Ltd. by artist Kwan Wai-nung are used by permission of Hong Kong Memory. Kevin, thanks for wonderful pictures and story. My sister and I always pick up Two Sisters Florida water and soaps when we go to HK. apsara: envy! Two Sisters Living Rose soap was one of my favorite things…and now it seems it’s vanished from U.S. shelves! I like going to LA Chinatown, just to look around. Next time I’ll look fur a bottle of this, I like Florida water! d3: Oh, I’m sure you’ll be able to find it there…hope you enjoy it. Oooh, I will look for this at 99 Ranch. This puts Tony Moly to shame with inexperienced SAs who couldn’t tell me what’s good about a certain cream that contains “Mayo”. What? You don’t know what Mayo is? Nope. And then she said horse oil (“Ma” = horse). She saw the horrified look on my face and quickly recanted and said it’s really not from horses? What? Never mind. The calendar posters look like they were also used for ads that appeared in Cuba! Hajusuuri: that’s interesting…isn’t horse meat “off the menu” in the U.S.? I remember reading an Atlantic article recently about that…. At any rate, this water will not cause alarm! I should have mentioned that it’s hand cream. Eeeek, and these lips will never consciously touch horse meat! I’ve about horse oil too! My friend bought a sheet mask that advertised contrasting horse oil. I’m honestly not sure what it really is…. Mayu? It does contain horse oil, it’s a side product from horses killed for their meat. It’s supposed to be very moisturizing. It’s horrible that the SA would back track and lie to you about an ingredient. I am new as a member. I usually just surf around, but have to jump in and thank Kevin for reviewing the summer staple from my childhood. This was the only “perfumed” or properly scented product I knew growing up. Many of the cosmetic products in my childhood had a harsh chemical smell, except Liushen. It accompanied me as “SOTD” after bath, feeling clean and refreshed after a extreme hot day, fallen asleep under the sky, since there was no air conditioning. Exactly as Kevin pointed out, many of us use the water after bath to cool down. It worked perfectly for me as mosquitoes repellent as well! Thanks again and I enjoyed your review! Makes me feeling very nostalgic! Valleyorchids…you’re welcome and thanks for commenting! Fascinating! You really sent me down a rabbit hole with this post, googling to find out more about Florida water and Liu Shen. There seems to be a cross-cultural consensus that Florida water is good stuff to deal with irritations of all sorts. In the Caribbean Florida water is used in Santeria for purification rituals. The Chinese version seems to be a homeopathic dose of traditional liu shen wan pills (seven spirits) pills used to quell inflammations. In addition to pearl dust and deer musk the pills often contain toad toxins or snake gall so I don’t think I’ll be trying of those soon. The Liushen cologne sounds great, though, and now I’m on a quest to find some. Kathryn: hope you can find a bottle!